On Saturday week, the 32nd Streets of Galway will be held, bringing thousands of runners though the heart of the city. For the past few years I have been running it, partly because of the annual challenge of it, but more so for the invigorating sense of freedom one gets by running through the streets of the city where we live and work. How often are we walking those streets, only wishing we could break into a jog or sprint. It would get us where we want to go quicker, instead of having to shuffle along avoiding loose cobblestones. I also run it for the reason that a few years ago when I was lying perilously ill in the HDU ward at UHG, I vowed that if I ever got out of that bed and learned to walk and run again, I would use every ounce of energy I have to make the most of every minute. The time when you are deprived the opportunity to do things is the exact time you most want to do them. And so every time I run the Streets, I feel a particular poignancy when I turn the corner at the hospital and think of my room and I try in some inexplicable way to send a bit of my energy to whomever is lying in my bed at that particular time; hoping that it might encourage them to have the same hopes and aspirations. But the Streets of Galway 8k is not just a race or a run — it is a community effort organised superbly by Galway City Harriers Athletic Club (GCH ) who organise an event that has been at the heart of Galway life for more than three decades and onwards it will go, especially now that it has been sponsored for the next three events by the Galway Clinic, which is after all, a very suitable fit. At around the 6/7 k mark, when you run past Pearse Stadium and down Rockbarton and come out onto the Prom, it is a moment that I wish everybody in the city could have. At the end of such a run, the sight of the sea makes you glad to be alive. It is a feeling we all should share. Closing date for entries this year is August 9 so you have a week left to get on board and share this experience. You don’t have to be a great runner, just have a great spirit. In the countdown to this year’s race, we’ve spoken to some well-known locals who have run the course and talk about what it means to them. “2016 was my first time running the Streets of Galway 8K. I was honoured to be asked to launch the event last year, two months before the run took place. On the way to the launch, I was going over what I would say in my speech and I genuinely felt that I couldn’t look the runners in the face and talk about the race without taking part in it myself. “Even though I’m sporty and would have done lots of charity walks, I had never run any kind of long distance, so I was quite nervous about being able to complete the race. I managed to rope some friends into it for moral support, so we all got to take part in it together. My only regret was that, because of my schedule, I didn’t manage to fit in as much training as I would have liked. “It was a great experience. There’s a fantastic sense of achievement when you finish the race, but I would say the most enjoyable aspect was the sense of fun and community between the participants and spectators alike. The encouragement offered by runners and the thousands of Galwegians who turned out to cheer people on really gives you great energy, and it creates a superb community atmosphere that you wouldn’t get anywhere else but Galway. “I have to say I caught the bug after doing the Streets of Galway 8k. I couldn’t wait to get going again, and I ran a 10k race a few weeks later. Since then, I have done numerous charity runs and I do the Park Run in Knocknacarra or Oranmore most Saturday mornings. I find it great for clearing my head and it’s also a great way to meet up with friends who I may not get a chance to see during the week. “It also means that we can enjoy a guilt-free ‘cheat meal’ breakfast after a good run. “The Streets of Galway has become one of my favourite events of the year having taken part these past few summers. “I’d never done any type of race before opening my own gym and had always been a weights guy but I took on the Streets of Galway four years ago to support some clients and have since gone on to complete half marathons, marathons and a half Ironman. “It’s an amazing day, so well run and with amazing support and atmosphere throughout. 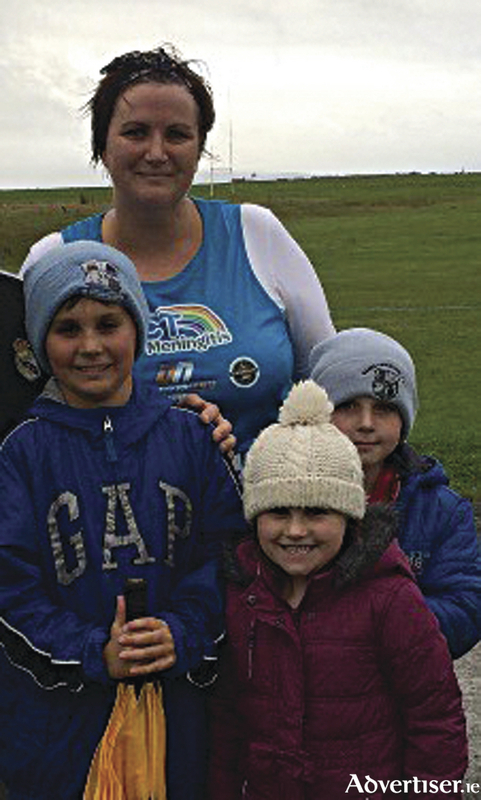 “This picture is of myself and my three children Eimhin, Noah and Sophie after I crossed the line after doing my very first Streets of Galway. They came out to cheer me on. I first ran the Streets of Galway in 2015. When I say ran, I mean that I ran, walked, jogged, skipped, but completed it that day. “We had got a group of people to support the charity ACT for Meningitis by taking part in the Streets. They were out training every week and I felt that it was something I wanted to do. “I proudly joined them that year wearing my ACT for Meningitis running top and together we ran the streets of my hometown. “I was joined by the charity supporters and a group of friends so it was a wonderful evening. I actually loved it. I was very nervous starting off but as the run took me through the streets of Galway it was a very special feeling. “Every corner I turned there were people cheering and encouraging us. As you hit the prom for the final part of the run you get a burst of energy and and it brings you home. “I was quite emotional as it was my first 8k and I had run to support the charity and to remember my daughter Aoibhe I had lost to meningitis. I haven’t done an 8k since but I have done some more 5ks which I enjoy. “What is unique about the Streets of Galway for me is the excitement and build up on the day. The pride of running through your home town and the unbelievable words and cheers of encouragement makes it a very special run,” she concluded. Everyone has a reason to run the Streets and a special memory of doing it. This year, create your own memory. Entries are still open but you’d better hurry. Remember in the Streets, you are only running against yourself, but with the support of those running with you and cheering you on. Page generated in 0.1935 seconds.